Good news guys, it's 2012, and gone are the days of sheepishly asking your girlfriend if you can borrow her ghd straighteners. These days styling your hair with ghds is just as much for men as it is for women. David Beckham's look in this photo is straightened with hair straighteners and then slicked back. In fact ghd designed the mini styler, and laterally the gold mini styler specifically for men, with its thinner plates for straightening and styling smaller sections of hair at a time. Perfect for straightening short, men's hair. Of course ghd straighteners can be used to straighten men's hair, but they are also perfect for creating texture and definition and when combined with the right hair products, they are ideal for creating that messed up look that appears like you have rolled out of bed, but actually takes ages to perfect! Most male celebrities and pop stars these days will use ghd straighteners as part of their daily routine, so if you want to impress the ladies, then it's probably time that you thought about introducing ghd to your morning regime. Jordan Konopate, from mens's fashion site Mr Style, says 'The modern man is keen to look good, and using ghds to style their hair, and emulate the look of their favourite celebrities, has become an important part of the daily routine for many men'. Straightening men's hair with ghd is easy, quick and really does make a big difference to your style! 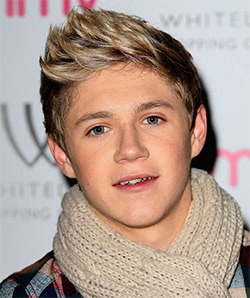 Niall Horan of One Direction with straightened fringe. To straighten gent's hair with ghds, first jump in the shower and wash your hair thoroughly using a quality shampoo. We would recommend using a salon quality shampoo as they really do make a difference to the condition of your hair. You'll find a great selection of shampoos and other male grooming products at mankind. Next, blow dry your hair ready for straightening. Again, for best results we would recommend using a high quality dryer such as the ghd air, which will produce excellent results, dry you hair quicker and minimise heat damage. And talking of heat damage, once your hair is dry and before you start to straighten you should use a ghd heat protect spray, which will prevent the ghd mini styler from burning your hair. 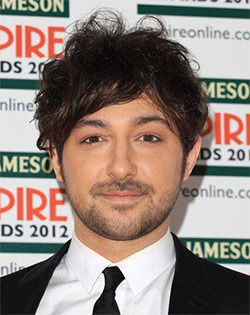 The ghd mini styler is also great for creating messy indie hair, like Alex Zane's in this picture. You can straighten all your hair, or alternatively what looks great on short men's hair is to straighten your fringe, sideburns and the back of your hair, then pick out sections from the top of your hair giving a more messed up, unstructured look. Once straightened, use some styling paste or wax and finger style to complete the look. Again messing the hair up a little looks great here. Tip - When applying product to your hair, take a small pea sized amount and rub it into the palms of both your hands then apply through all your hair before finger styling. This will give your hair a more natural styled look and the product will blend in with your hair. A common mistake people make is just applying product to the one area that they are looing to style and ending up with a look like Simon from the inbetweeners! So guys, create the hair styles you crave with ease with the ghd mini styler. Check out our price comparison pages to find the best deal and cheapest price online from ghd approved retailers. Do you straighten your hair with ghd straighteners? Any tips for straightening guys hair? Please feel free to add a comment below, we'd love to hear from you!